As a self-proclaimed cheapskate, I always, always look for the best possible deal. And that means before I order a book from, say, Amazon, I spend time perusing other sites (as well as price-comparison services) in search of a lower price. 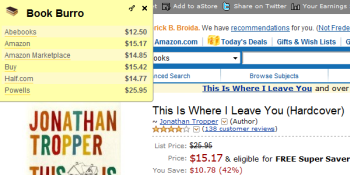 I recently discovered a cool Firefox add-on that lets you compare prices on books in a snap--and even check your local library's catalog for the title. But first, let's have some fun. I just came across two sites that let you create kooky graphics and quick 30-second videos--for free. Want to soup up your Facebook profile picture? Create some custom artwork to go with, say, a party invitation? How about generating some fun and eye-catching photo art for your blog? For all this and more, head to ImageChef, where you can whip up cool images in a matter of minutes. The site offers four main categories. In Sketchpad you can assemble a collection of images and symbols from a sizable, searchable library. Simple tools let you add text, upload photos, and change the color and fill pattern of each object. When you're done, you can save or share the finished product. Poetry Blender overlays text, symbols, and/or photos on your choice of about a dozen animated backgrounds, which you can likewise save, share, or embed. These are great for sprucing up, say, a blog or MySpace page. I'm particularly fond of Word Mosaic, which turns your text into a mosaic in the shape of any of ImageChef's aforementioned symbols. 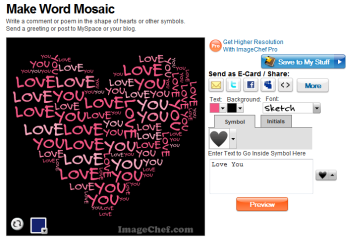 Or you can form your mosaic from initials, which would be neat for a party invitation or the like. Finally, ImageChef offers several dozen kitschy, cute photo frames. Just upload your photo and center/resize it inside, say, a pendant or record-album cover. The same sharing options apply. Fun stuff. ImageChef is free to use, though you get a bit more functionality by registering (also free). 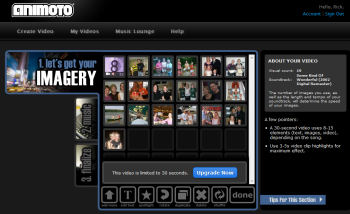 Want to create a custom video, the kind with photos, video clips, and music? Normally, it's a time-consuming and/or expensive hassle. You can use Microsoft's Windows Live Movie Maker free of charge, but it's pretty limited--and kind of a pain in the neck, in my humble opinion. You could also spend upwards of $100 on a movie-editing package like Adobe Premiere Elements or Pinnacle Studio. But those are big, complex apps--and like Movie Maker, they have to be installed. Surely there must be some kind of cloud-based solution? There is, and it's called Animoto. This cool service makes moviemaking embarrassingly quick and easy, and the results look like something that took days or weeks to create in a commercial movie-editing program. It's a three-step process. First, you upload your photos and/or videos. If your stuff's already online somewhere else, no problem: Animoto can pull media from Facebook, Flickr, Picasa, and other sites. Second, choose your music. You can upload a favorite MP3 or choose a track from Animoto's extensive (but mostly indie) library. Third, select a pace for your video: normal, half speed, or 2X speed. With that done, Animoto goes to work, assembling everything into a seriously slick music videos, complete with titles, transitions, and special effects. Don't like the finished product? You can make changes manually or just let Animoto have another whack at it--it'll generate different results every time. When you're satisfied with the results, you can share the video via the usual methods (Facebook, Twitter, e-mail, etc. ), or download it for your own use. I like Animoto's pricing options a lot. You can test-drive the service for free, but that limits you to a 30-second movie. If you want a full-length flick, pay just $3. Or, if you see yourself using Animoto a lot, $30 buys you a one-year membership (with all the videos you care to make). Whether you're looking to have a little video fun or produce something meaningful for a special occasion, Animoto takes virtually all the hassles out of traditional movie editing. Book Burro is a Firefox add-on that takes the hassle out of looking for better deals on books. After installing it (and restarting Firefox, natch), just head to Amazon, Buy.com, or a similar store and find the listing page for the book you want. Then click the Book Burro button that appears in the upper-left corner. In a matter of seconds you'll see the prices from half a dozen other stores, including Abebooks, Amazon Marketplace, and Half.com. Venture into Book Burro's settings (by clicking the little wrench icon on its toolbar) and you'll see the option to add even more stores: Barnes & Noble, PaperBackSwap, and so on. Even cooler, Book Burro can check to see if your local library has the book.